After a hard day of killing monsters and taking their stuff, Spyke and Flower like to retire to their new favorite pub, The Red Dragon Inn . . . where they kill monsters and take their drinks. 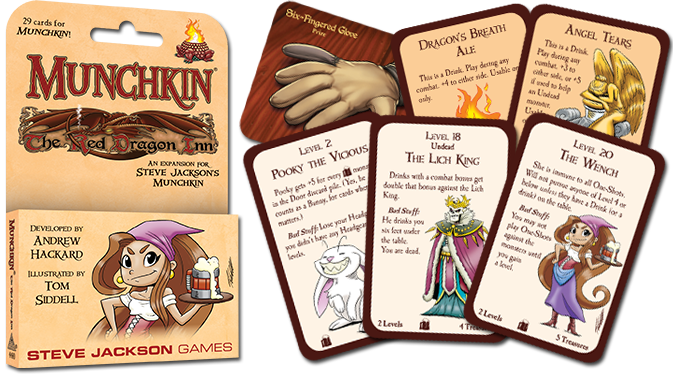 In partnership with SlugFest Games, we're pleased to announce Munchkin: The Red Dragon Inn, a 29-card* expansion for classic Munchkin or any other set with fantasy backs. (Or add these to any game with Munchkin Door & Treasure Sleeves!) It has some fan-favorite monsters from The Red Dragon Inn series, along with an entire menu of crazy drinks for ultimate hack-and-splash fun! You don't need to know The Red Dragon Inn to enjoy this expansion. * Includes a 30th card, a promo Prize for The Red Dragon Inn itself. If you haven't tried that game, it's a lot of fun . . . and you and a pal can try it with the new two-player version, The Red Dragon Inn Allies: Spyke & Flower, also available in September!